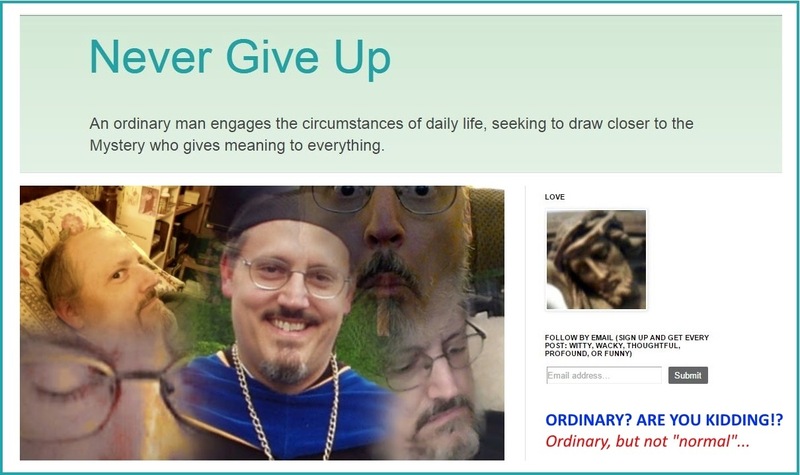 Never Give Up: I'm Still a Teacher, Even Though I Can't "Do the Job"
I'm Still a Teacher, Even Though I Can't "Do the Job"
Over the past four years, this blog has been one way in which my work as a teacher has continued even "after" everything came crashing down in 2008. My task has been reborn and even expanded in ways I never would have imagined before chronic health problems brought about my (very) early retirement from the standard classroom and the dynamic life of a college institution. I've done an awful lot of "blogging" -- enough to have realized that a blog is its own kind of place for communication. I was going to commemorate with Internet bells and whistles my one thousandth blog post, but apparently I passed the thousand mark without even noticing. (This is post number 1005.) Although I have been posting more pictures and experimenting with multimedia formats, writing is still the main feature of the Never Give Up blog. I try to use my understanding to see the purpose of things and to express myself with words. I also have a lot of problems. Nevertheless, even when I feel overwhelmed, I try to articulate what I think is the meaning that I'm seeking, or rather begging to see in all of it. Sometimes I articulate it pretty well, and it "sounds like" I have acquired a vital understanding of deep things. Nevertheless, right now, I still have these words. And I have this desire to share my words with others. Indeed, I am charged with task of sharing these words with the persons who are entrusted to me. I am called to share the search for beauty and truth and goodness that propels my own life, to walk with others on this journey and to help them with whatever understanding I find. There is a "light" that nearly always "stays on" somewhere in my soul, not to dispel my own darkness so much as to enable me express my experience in words -- my experience of weakness in faith and the obtuseness of bodily and mental affliction, as well as the strange and mysterious presence of Another and the hope He generates and sustains within me, a hope that refuses to go away. A charism is at work here, rooted in the enduring vocation of teaching. I may not have a "teaching job" anymore, but I am still a teacher. I couldn't stop being a teacher even if I tried. When I perceive something -- even if it has only gained a tenuous and embattled foothold on the shores of my heart -- I am moved to communicate it. This charism also works within a whole complex set of motives, wrestling with pride, self-love, enormous vanity, the desire for appreciation, and all the distortions, hesitations, and fear that come from my damaged mind and stunted emotions. No doubt there are many wasted words. Nevertheless, people find something in all my words that helps them. Not many people, perhaps, but a few. The charism shines through, because this grace has been given first of all for you who read or listen to me and are drawn by the Lord to see the mystery and the pain of life in a different way. A charism is given to build up God's people. In that sense, the fact that I'm a bumbling, incompetent Christian and a hypocrite looking for applause doesn't matter. If you find anything helpful in what I say it's because He loves you and wants to encourage you, strengthen you, and draw you to Himself. He also wants to shape my life, and I really want to live the truth of this charism! Well... sometimes I really want to. Often I forget all about it, or I say something like, "Jesus make me holy... but not yet!" Most of the time, I'm just afraid. I'm afraid of the depths. I'm afraid of suffering. But something is different. There is this hope. I know He is here, He is with me. I have hope because He has touched my life and awakened hope within me. Hope is the living memory of that encounter and the fruit of His embrace that continues even when I can't "feel it." It is this hope that fills me with an urgency to express encouragement: "He loves us. He is here with us. He will not abandon us!" I feel like I'm nearly drowning in the flood of life, but something moves me to tread water and swim as best as I can. I sink under the water a lot, but in my struggle and thrashing I've also seen the land. It's not far away. And here we are -- all of us awful swimmers in these deep and strange waters -- and I can't help crying out, "Look, look, this way. There is the land. We are going to make it! We are going to be okay."